I've written before on everything I know about cars which is a lot more than some but no trained mechanics will be shaking in their boots any time soon. In fact quite a few backyard mechanics kick sand in my face too (metaphorically speaking of course). My vehicle, known as the frog van, recently renamed the old boiler in this Barossa Festival post, has finally succumbed to its overheating problems to the point where I had to do something about it. I tried to fix it the day before we went to see the Vintage Festival Parade at the town of Nuriootpa. I was thinking it may be a thermostat issue. After much research and consideration about where the thermostat actually was on my van I pulled things apart and did the 'boiling water' test to see if the thermostat would open. It did. Crap! Essentially that meant I'd wasted a bottle of coolant (which had only been in the engine less than a week), had to replace a perfectly fine thermostat gasket and not found the overheating problem. Still, I now know more about car thermostats and how they work. That was my last best guess at the problem because the cooling system wasn't leaking or losing water (except to evaporation and the overflow pipe as a result of it overheating). After that I figured it might be a water pump issue but I'm definitely not up for pulling that out. As well I couldn't help feeling that if the water is boiling in the radiator then the water pump must be working because the radiator removes heat from the engine it doesn't actually heat anything up its self. So I bit the bullet and went in to see a proper mechanic. Described the problem - van overheats at 60kmph or greater but the temperature remains relatively stable at lower speeds during shorter drives. The mechanic said it sounds like a blocked radiator. Of course! Well I believed him anyway because that sounds cheaper and easier to fix than a water pump. It seems mechanics in my home town are all backed up with work no matter where you go. This guy was no different but suggested I take the van to a specialist radiator mechanic on the other side of town (not that far when you live in a small country town). When I got to the radiator guy he seemed to concur with the mechanic after I told him the van wasn't leaking. Seemed promising. I asked him when he could take a look at it - he said Thursday (3 days time). Then he asked "Are you able to take the radiator out?" "Err... well no because I have to drive it here." "Well we can't look at it unless you take the radiator out yourself because we don't like working on vans. Too fiddly and you have to crawl all around and underneath them - plus it'll save you some money." You know I might have gone somewhere else if he hadn't of said "plus it'll save you some money". You might think his attitude to vans is a crock but if you've ever worked on a van engine... I don't blame him. The frog van's engine is right under the passenger seat. To get the radiator out you have to pull out the drivers seat, remove a panel so you can see more of the engine then crawl under the front to remove the four bolts that hold the radiator in place. 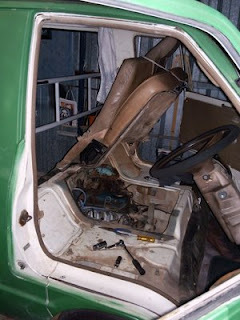 See the photo of the van parked in my studio - drivers seat and radiator removed. It is pretty tricky and I've never taken out a radiator before so I know how to do that now. Visually, you can't really tell if a radiator is blocked. You can look in from where the radiator cap goes at the top to see a few of the pipes but that doesn't really tell you much. Externally it's got a bit of mud caked into the core but it's all old mud that was there long before the van started overheating (we're talking previous owner old because I've not really driven on anything except sealed roads). At the moment the frog van is out of action. At the time of writing this there's still two days to go before I can take the radiator in to get it fixed, cleaned and unblocked (or re-cored even). I just hope this will solve the problem. Over the next few days I suspect I'm going to be learning even more about cars. The van has a fairly serious 'running on' problem. For the uninitiated that's where you turn the engine off via the key and the car keeps running until it runs out of fuel in the cylinder heads. It's not so bad most of the time but again, after a long drive, it can run on for quite some time requiring me to put the car in gear to 'stall' the engine. Should you be reading this and you know how to fix that kind of problem please let me know in the comments. You'll be doing me a great favor and who knows, I may just write about you in this continuing saga of the frog van. I don't like where the engine is - right under the passenger seat! That puts it right inside the van too, only encased underneath. Wouldn't like the engine to set on fire! Don't think about using hills and long drives until it's fixed properly1 I think you said that you had some retreads put on, so hope they're not getting too worn with all the travelling. Aren't these mechanics supposed to 'crawl around and go underneath' when they are fixing cars etc! I thought it came with the job! Maybe it's because he's a radiator specialist! Perhaps the first mechanic suggested this so he didn't have to 'crawl around and underneath' etc! Hope he was genuinely doing you a favour, and the specialist bloke. Some vans do have a kind of bonnet, engine cavity area in the front - though nothing like the length of a car bonnet. I still think the bulk of the engine is probably still under the seats though (that's why you sit so high up in a van compared to a car). With the seats down there is a kind of fire wall to protect you should the engine catch fire but you'd want to get out pretty quick all the same. The particular radiator mechanic I went to doesn't have a hydraulic lifter (car hoist) thingy so you can just walk underneath - hence that could be why he's not a fan of working on a van. Not to worry. The more I work on stuff the more confident I get about fixing my own engine troubles. I ended up walking to the radiator place carrying the radiator from a strap over my shoulder. It's not that heavy or large so wasn't much of a problem.